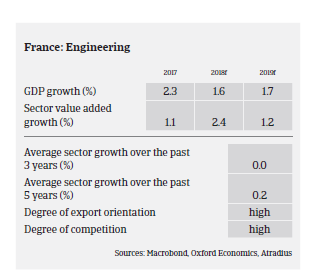 After good performance in 2016, French machinery sales grew 2.3% in 2017 mainly due to growth in exports, with Germany as the main destination. In H1 of 2018 machinery sales (domestic and export) increased 8.6%. The outlook for H2 of 2018 and 2019 remains positive, as both production and demand continue to grow. The manufacturing-related machinery segment is driven by increased investment by automotive, aircraft and chemical businesses, both domestic and abroad. Domestic demand remains dynamic, with more investment by the manufacturing sector in modernising production sites (“Industry 4.0”). Sales of industrial robots increased 29% year-on-year in 2017. Order books of the manufacturing-related machinery segment are well filled (more than three months). The construction related machinery segment recorded 11% growth in activity last year, driven by the lifting and handling equipment segment (up 13.6%). The outlook for the coming months remains stable for the time being; however, there are indications that the rebound in construction activity has already reached its peak. Machinery businesses related to agriculture/farming showed a modest rebound in 2017 after decreasing sales in 2016. However, sales growth is forecast to pick up in 2018 (up 8%) and margins are about to increase, due to higher demand from farmers and higher prices. The boiling and piping equipment machinery segment, which is highly dependent on the oil and gas industry, is still suffering from low demand coupled with higher raw material prices. In the capital-intensive machinery industry financing needs are high. As a result, businesses in this sector can incur large debts that weaken their financial structure and overall solvency, putting undue stress on liquidity. However, in many cases advance payments, along with increased use of factoring contracts, can improve suppliers’ cash situations. Additionally, banks are willing to lend to the machinery sector for investment through leasing or long-term loans. In the current situation many machinery producers are under pressure to either expand/grow (which requires additional investment) or refuse orders. Current difficulties hiring skilled staff is a real issue, impacting further business expansion. 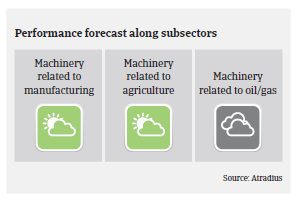 Profit margins of machinery businesses have increased over the last 12 months due to the benign business environment, but could decrease slightly in the coming months due to higher prices of metals and energy and because capacity issues have led to increased use of subcontractors. 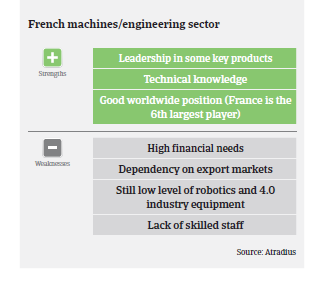 On average, payments in the French machinery sector take 60-70 days, and payment duration has been decreasing. The level of protracted payments has been low over recent years. In H1 of 2018 non-payment notifications remained stable at a rather low level, and no deterioration is expected in the coming six months. Insolvencies decreased about 8% in H1 of 2018, but we expect this trend to level off in H2 and in early 2019. 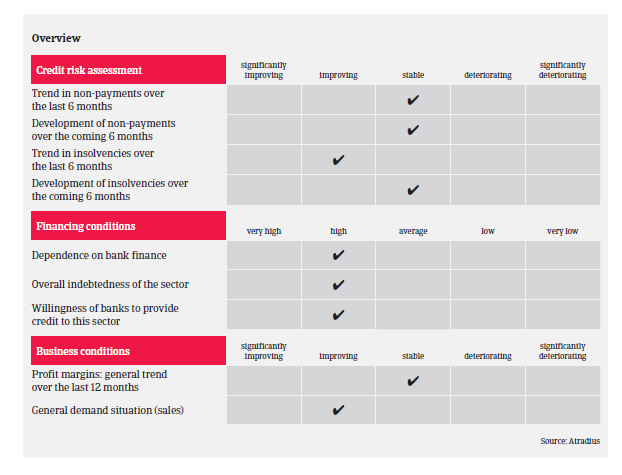 In view of the current performance and positive outlook, our underwriting stance remains open for most segments. However, we are still cautious with machinery businesses dependent on the oil and gas sector, which are still facing low demand and are often highly leveraged.